The first thing I cringed at when we walked into this house was the size and look of the kitchen. I've lived in and used kitchens this small and unattractive before (and actually worse- my second kitchen, that I lived in for a year, didn't even have running water!)... but with all of those, I knew they were short-term. And if I was looking for a kitchen that I might be living in and using for a long time, and with three children, I hoped for something bigger. But my husband promised me we could fix the size and appearance of this ugly kitchen, and so that is what we set forth to do since obtaining the keys in March. 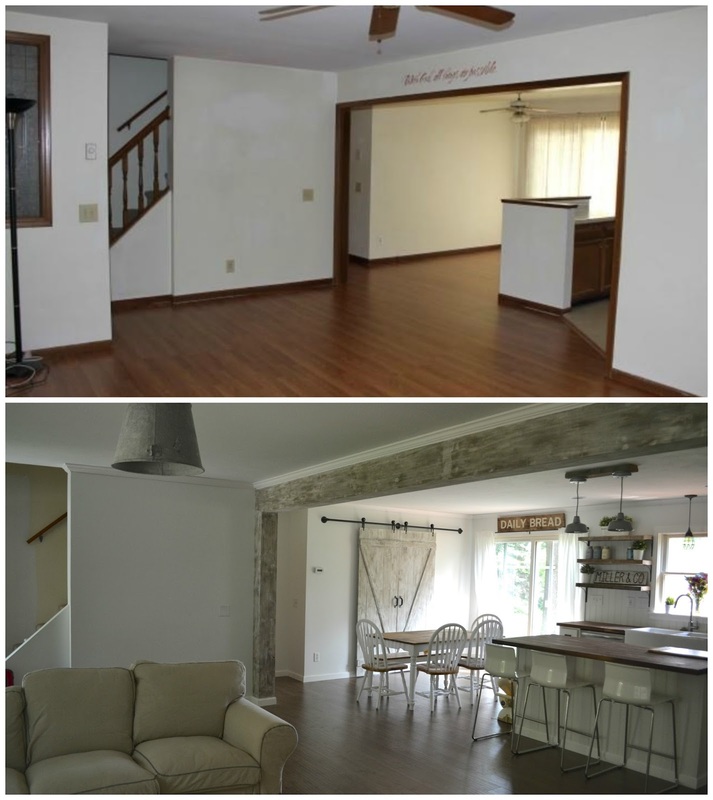 If you missed my last post, on the kitchen reveal (which includes more pictures and information about our updated kitchen), you might want to check that out here. So, here you go friends! Here is the Before & After of what this kitchen looked like four months ago and what it looks like today. 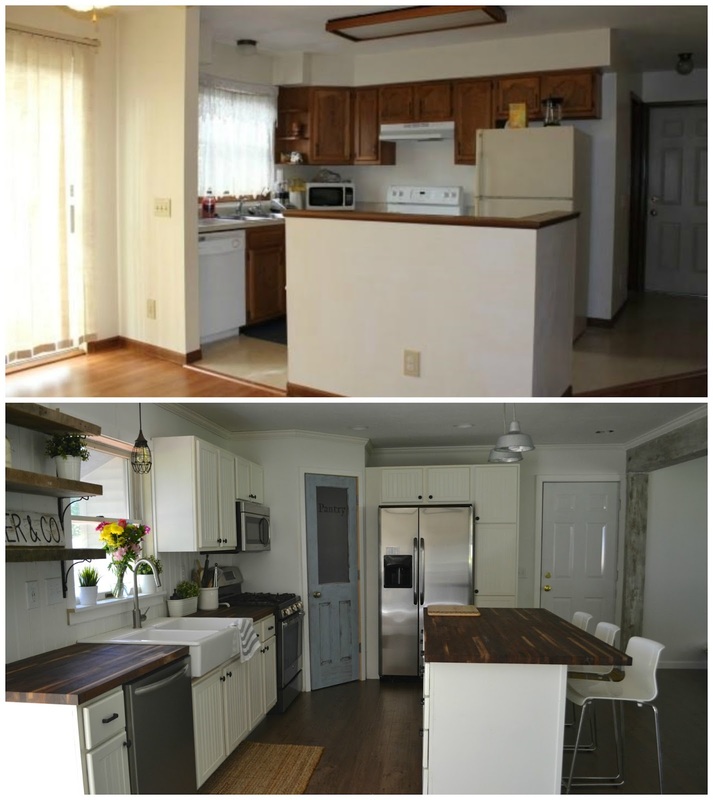 First, here are just a few different angles of the kitchen in its entirety. We knocked out some walls and moved the laundry and half bath that was behind the wall with the fridge to make more room in the kitchen. We added a corner pantry as well as more cabinets, and we put up barn wood open shelving. 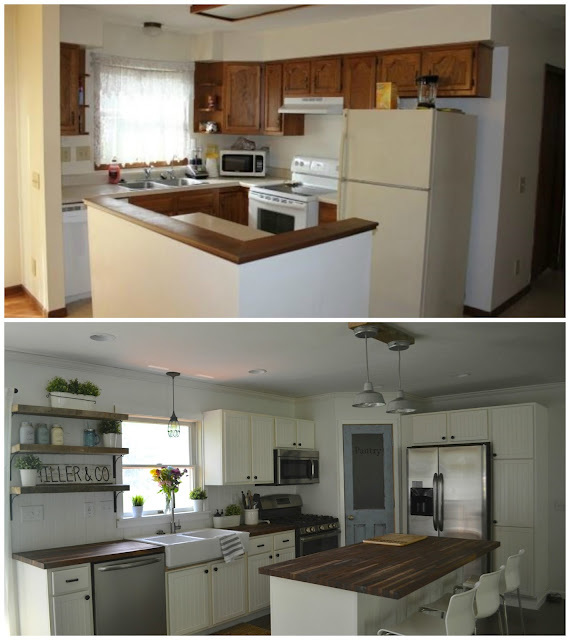 We bought new cabinets and painted them white and added beadboard. We bought a new sink and appliances, we built a new island, we changed out the old lighting for new lighting, and we took down that awkward '90's divider wall by the dishwasher. 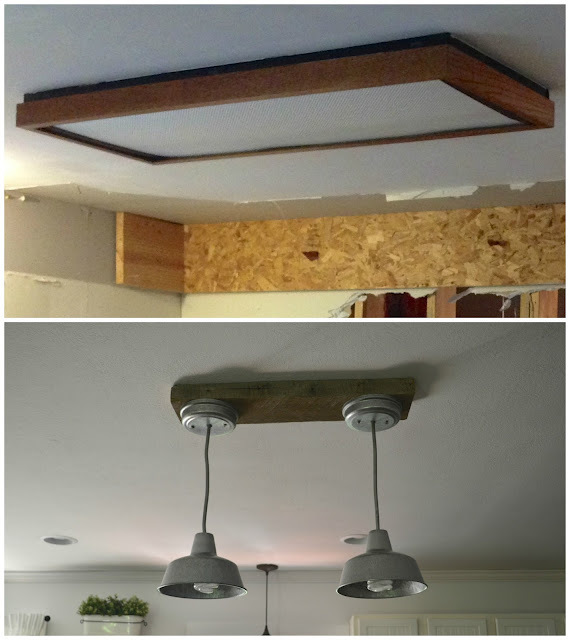 We knocked down the wall dividing the kitchen and living room and put a beam up. We painted everything a fresh new white as white comes. We took down ceiling fans. We cut a door where we put the barn doors... this used to be a bedroom with a different entrance, but we split the room in half and now this half is a half bath and laundry room (the other half will be part of our master bath/closet). We bought new curtains and laid down a new floor. 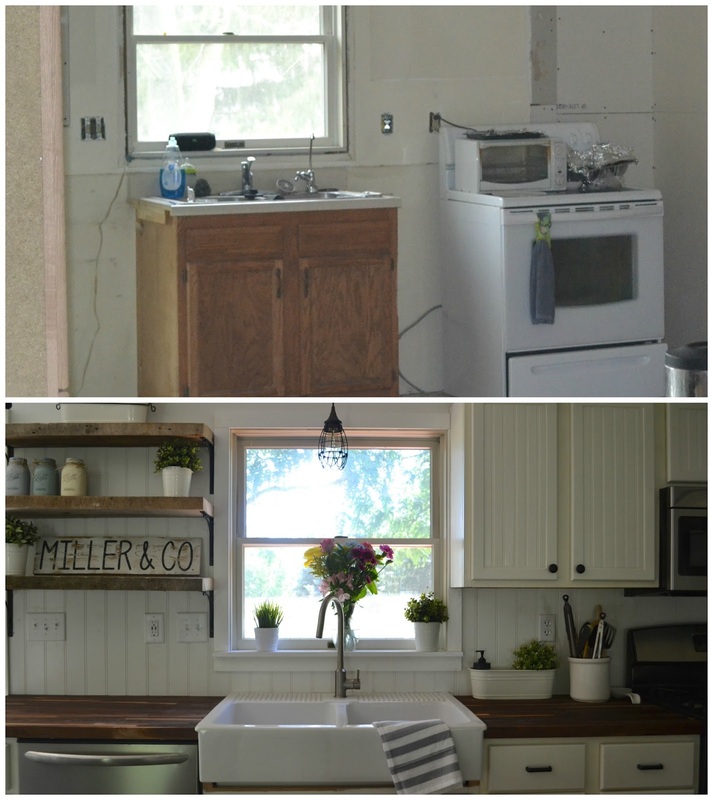 The old sink (this is a "in the middle of the renovation" picture) got the boot, and I love my new ikea farmhouse sink! The old light was AWFUL! I'm not extremely picky about many things in life, but fluorescent lights really make it hard for me to find peace. So, this baby definitely had to go. Plus, it's definitely an eye sore. I really love the new lights! And since everything else was getting renovated, I gave our table a makeover too! 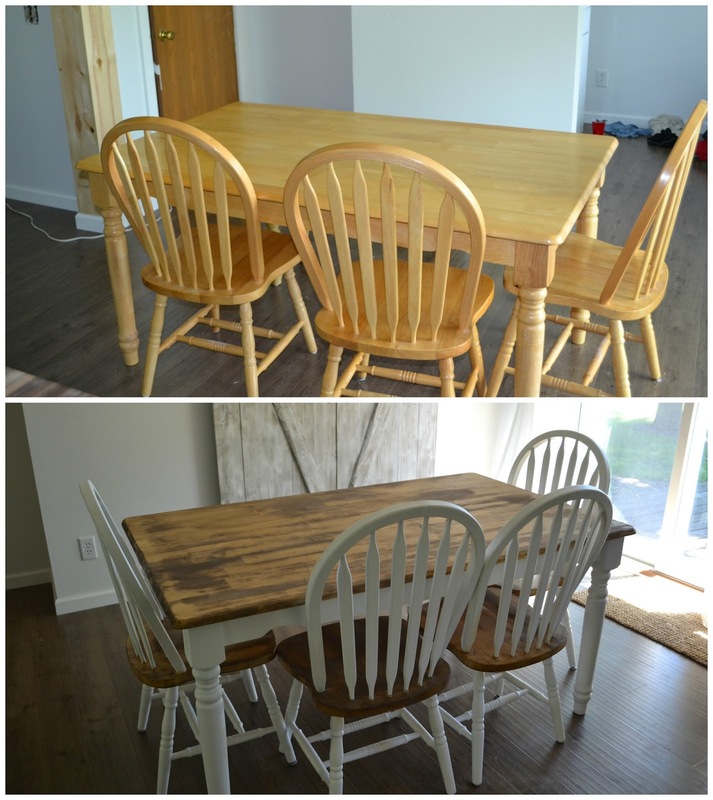 Chalk paint + Stain = Heaven! I can barely remember what this house just looked like four months ago! Of course, we always wish we had endless hours to get projects done (and endless finances), but we are overall really pleased with all that we have been able to get done in the past four months and praise the Lord for supplying us with the time and the money that He has graciously given us.